Iran-backed rebels in Yemen fire rockets into a residential district, killing 14 civilians, mostly women and children. Iran-backed rebels in Yemen fired rockets into a residential district of Taez, killing 14 civilians, mostly women and children, officials told AFP on Monday. The bodies of those killed, including seven women and four children, were taken overnight to the morgue at a public hospital in Taez, said the medical officials. Several other civilians were wounded and hospitalized. The Shiite Houthi rebels and their allies had fired Katyusha rockets on Sunday targeting the district in central Taez, according to medics and residents. Viewed as the key to controlling the capital Sanaa, Taez has been the scene of deadly fighting between the rebels and loyalists of Yemen's exiled government. 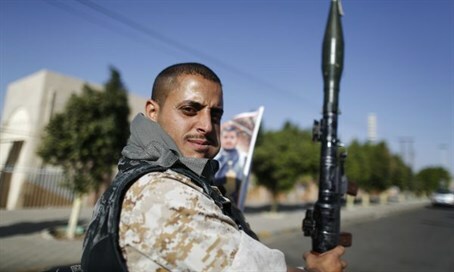 Battles in the city, southwest of Sanaa, have intensified in recent weeks as loyalists pressed an offensive in which they have so far recaptured five southern provinces, according to AFP. Pro-government forces claim to control "75 percent" of the city, including the presidential palace and the residence of former president Ali Abdullah Saleh -- whose supporters are fighting among Houthi ranks. This could not be confirmed from independent sources, however, the news agency reported. Meanwhile, Saudi-led warplanes carried out several strikes Monday against rebel positions in the province of Marib, east of Sanaa, officials said. One official said up to 53 Houthis were killed in the raids, but there was no independent confirmation of the report. A Saudi Arabian-led alliance began launching airstrikes on the Iranian-backed Houthi rebels on March 26. It is believed Iran is planning to use the Houthis to take over Yemen and seize the key strategic port of Aden, which controls the entrance to the Red Sea and ultimately to the Israeli resort city of Eilat, though Tehran denies the charges. The Houthis have seized control of large parts of the country including Sanaa, forcing President Abd-Rabbu Mansour Hadi to flee to the southern port city of Aden and then Saudi Arabia.